Disk removal is one of the most common types of back surgery. Diskectomy (also called discectomy) is the removal of an intervertebral disk, the flexible plate that connects any two adjacent vertebrae in the spine. Intervertebral disks act as shock absorbers, protecting the brain and spinal cord from the impact produced by the body's movements. Removing the invertebral disk is performed after completion of unsuccessful conservative treatment for back pain that has been present for at least six weeks. Surgery is also performed if there is pressure on the lumbosacral nerve roots that causes weakness, bowel dysfunction, or bladder dysfunction. As a person ages, the disks between vertebrae degenerate and dry out, and tears form in the fibers holding them in place. Eventually, the disk can develop a blister-like bulge, compressing nerves in the spine and causing pain. This is called a "prolapsed" (or herniated) disk. If such a disk presses on a nerve root and causes muscle weakness, or problems with the bladder or bowel, immediate disk removal surgery may be needed. The goal of the surgery is to relieve all pressure on nerve roots by removing the pulpy material from the disk, or the entire disk. If it is necessary to remove material from several nearby vertebrae, the spine may become unsteady. In this case, the surgeon will perform a spinal fusion , removing all disks between two or more vertebrae, and roughening the bones so that the vertebrae heal together. Bone strips taken from the patient's leg or hip may be used to help hold the vertebrae together. Spinal fusion decreases pain, but decreases spinal mobility. Approximately 150,000 Americans undergo disk removal each year in the United States. removed. If the disk itself has become fragmented and partially displaced, or is not fragmented but bulges extensively, the surgeon removes the damaged part of the disk and the part that lies in the space between the vertebrae. There are minimally invasive surgical techniques for disk removal, including microdiskectomy. In this procedure, the surgeon uses a magnifying instrument or special microscope to view the disk. Magnification makes it possible to remove a herniated disk with a smaller incision, causing less damage to nearby tissue. Video-assisted arthroscopic microdiskectomy has exhibited good results with less use of narcotics and a shortened period of disability. 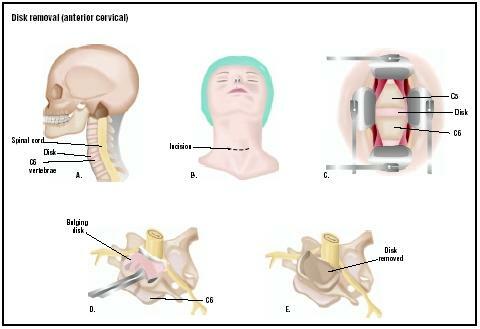 Newer forms of diskectomy are still in the research stage, and are not yet widely available. These include laser diskectomy and automated percutaneous diskectomy. Total disk replacement research in the United States is underway. Products under investigation include the ProDisc (made by Spine Solutions, Inc.), and the SB Charite III (made by Link Spine Group, Inc.). In these clinical studies, a significant number of patients who received artificial disk implants report a reduction in back and leg pain; 92.7% state they are satisfied or extremely satisfied with the procedure. The physician will obtain x rays and neuroimaging studies, including a computed tomography (CT) scan, myelogram, and magnetic resonance imaging (MRI); and clinical exams to determine the precise location of the affected disk. An hour before surgery, the patient is given an injection to dry up internal fluids and encourage drowsiness. After the operation, the patient is lying flat and face down when he or she awakens. This position must be maintained for several days, except for occasional positional changes to avoid bedsores . There may be slight pain or stiffness in the back area. Avoid sitting for more than 15–20 minutes. Avoid bending at the waist, twisting, or lifting heavy objects. Begin gentle walking (indoors or outdoors), and gradually increase exercise . Exercise should be continued for the next four weeks. Begin stationary biking or gentle swimming after two weeks. Slow down if they experience more than minor pain in the back or leg. Refrain from sitting in one place for an extended period of time (e.g., long car ride). Patients should be able to resume normal activities in four to six weeks. The most common risk of the surgery is infection, which occurs in 1–2% of cases. Rarely, the surgery damages nerves in the lower back or major blood vessels in front of the disk. Occasionally, there may be some residual paralysis of a leg or bladder muscle after surgery, but this is the result of the disk problem that necessitated the surgery, not the operation itself. In properly evaluated patients, there is a very good chance that disk removal will be successful in easing pain. The surgery can relieve pain in 90% of cases; however, there are some people who do not achieve pain relief. This depends on a number of factors, including the length of time that they had the condition requiring surgery. Disk surgery has a "good to excellent" result in 87% of patients over age 60. The surgery can relieve both back and leg pain, especially the latter. Prior to disk removal surgery, a patient usually undergoes treatment with medical or physical therapy. Disk removal surgery may be indicated if these treatments are ineffective, or if emergency symptoms (i.e., bladder and bowel dysfunction) develop. See also Bone grafting ; Spinal fusion . Beauchamp, M.D., Daniel R., Mark B. Evers, M.D., Kenneth L. Mattox, M.D., Courtney M. Townsend, and David C. Sabiston (Editors). Sabiston Textbook of Surgery: The Biological Basis of Modern Surgical Practice. 16th edition. London: W B Saunders Co., 2001. Bogduk, Nikolai, Brian McGuirk, and Boriana Dirk Van Der Deliiska. Medical Management of Acute and Chronic Low Back Pain. Philadelphia, PA: Elsevier Health Sciences, 2002. Cailliet, Rene. Low Back Disorders: A Medial Enigma. Philadelphia, PA: Lippincott Williams & Wilkins, 2003. Lawrence, Peter F., Richard M. Bell, and Merril T. Dayton, eds. Essentials of General Surgery. 3rd edition. Philadelphia, PA: Lippincott, Williams & Wilkins, 2000. Resnick, Daniel K., ed. Surgical Management of Low Back Pain (Neurosurgical Topics). 2nd edition. Rolling Meadows, IL: American Association of Neurological Surgeons, 2001. Watkins, Robert G. Surgical Approaches to the Spine. 2nd edition. Berlin, Germany: Springer Verlag. 2003. Alini, M., P. J. Roughley, J. Antoniou, T. Stoll, and M. Aebi. "A Biological Approach to Treating Disc Degeneration: Not for Today, But Maybe for Tomorrow." European Spine Journal 11, no. 2 (October 2002): S215-20. Deyo, R., and J. Weinstein. "Low Back Pain." New England Journal of Medicine 344, no. 5 (2001): 363-70. Oskouian, R .J., Jr., J. P. Johnson, and J. J. Regan. "Thoracoscopic Microdiscectomy." Neurosurgery 5, no.1 (January 2002): 103-9. Silber, J. S., D. G. Anderson, V. M. Hayes, and A. R. Vaccaro. "Advances in Surgical Management of Lumbar Degenerative Disease." Orthopedics 25, no.7 (July 2002): 767-71. North American Spine Society. 22 Calendar Court, 2nd Floor, LaGrange, IL 60525. (877) Spine-Dr. E-mail: info@ spine.org. http://www.spine.org . National Institutes of Health. 9000 Rockville Pike, Bethesda, MD 20892. (301) 496-4000. Email: NIHInfo@od.nih. gov. http://www.nih.gov/ . Spine Health.com . Total Disc Replacement. 2003. http://www.spine-health.com/research/discupdate/artificial/artificial04.html . [cited March 19, 2003]. American Academy of Orthopaedic Surgery (AAOS) and American Association of Orthopaedic Surgery. Low Back Surgery. 2001. http://orthoinfo.aaos.org/booklet/thr_report.cfm?thread_id=10&topcategory=sp . [cited March 19, 2003]. Carol A. Turkington Crystal H. Kaczkowski, MSc. Disk removal is performed by an orthopedic surgeon or neurosurgeon in a hospital setting. Is disk removal the only option available? How many disk removal surgeries has the surgeon performed? I AM POSSIBLY HAVING L5S1 TRIMMED OR REMOVED , I AM 40 GOOD NORMAL HEALTH 6 FOOT AND 70 KG , I AM A HGV DRIVER AND HAVE BEEN SUFFERING FOR AGES ? ITS NOT NICE FIRST THING IN THE MORNING !!! My mother went through this surgery (for L4/L5). The operation was successful (DRs say that). But the region around the operation took long time to heal (she has Diabetes) and finally, after 50 days, it did heal up but my mother still has severe pain around the operated region and in the back. Drs say that this is due to infection and will continue to be like that until the infection if fully cured. I HAD DISK SURGERY 3 YRS. AGO AND I STILL HAVE RESIDUAL PAIN AND SOMETIMES MY LEFT LEG GETS REAL STIFF. THIS STIFFNESS CAUSES ME TO DRAG MY LEFT LEG AND FOOT. WHEN I DO EXERCISES THIS HELPS TO MAKE MY LEFT LEG FEEL SOMEWHAT NORMAL, LIKE MY RIGHT LEG. MY QUESTION IS, WHY IS THIS OCCURRING TO MY LEFT LEG? My 24 yr old son has recently, (2 weeks now) had his L5/S1 disk removed, as he too had a prolapsed disk, and he couldn'd walk and was in extreme pain. One hospital in particular just masked the problem with Morphine, and sent him home! Twice!! Anyhow, he is getting around fantastically now, but still has some pain down his right leg, and has developed pain in his left leg also?? Not as bad as the right though. He still has numbness to his right foot and back of the ankle, but at least he is walking and 'dancing', (a bit)...his words.."I love the Doctor..I can dance again". I WIL HAVE SURGERY 12 JULY, Laminectomy and Disk reaplace, body fusion, I'M worry,I'm afraid. I have 2 slip discs for quite some time pain daily take pain med for 8 yrs now.I have a dr that is going to remove the disc,but the thing that sounds strange to me is the dr said he is going to remove the disc but not put anything its place.Can someone please give me any advise or anyone know anyhting about this. Well I had a diskectomy 5 weeks ago. My first 2 days after surgery were amazing. It felt like I got my life back, but then on the 3 day things started to not look so good. The pain was coming back in my right leg and this time from the bottom of my foot and up my leg. As days went by the pain got worst. I finally got my family doctor to send me for a CT scan because I knew something wasn't right. No thanks to my surgeon that this was happening because she doesn't allow any early fallow ups in her office according to her secretairy it's all done through video confrence. No execptions, she said to me. Anyhow long story short I finally got my results today and it looks like I have in our form of speech a blood blister that has formed where the surgery was preformed and has caused this blood blister to pinch on my nerves again. :( Very frustrating and discouraging. So I ask now what, well he thinks with either time it will burst and realise the pinching or surgery again. I finally get to see my surgeon not in person mind you but on video Thursday and I guess I will know more. Has anyone else been through what I have??? I need some advise! I need your opinion!! I have had torn discs for 3 years. (L4L5SD1) i have been told that my doctor is giving me a choice of having L5 out as it is protruding. I have taken medication for the past years and it is not working as effectively. I am now seriously thinking about this surgery. If it eases some of my pain and gives me some life back it will be worth it. I have had 3 separate anterior cervical discectomies, with cadaver bone grafts. I've had problems from day one with swallowing, choking, & continuing nerve pain. Now I have a huge hump on the back of my neck. My question is: Do they use the infuse graft along with allografting? I have every symptom that they say come from using this type of grafting. I understand there's a class action lawsuit regarding infuse grafting. Very useful information provided here. I have some one who can take care of your back while doing surgery. after 12 months of pain I am off to see a neuro surgeon back end of july. for 1st 6 months doctors told me I had a torn periformis muscle and gave me pain killers, October 2012 things went from bad to worse, husband took me to a hospital in kent as we were away on holiday and I was then told I had torn my hamstring too, again pain killers. we went to india in January this year and my husband took me to see a doctor who sent me for an mri scan, low and behold l5-s1 way out, came back to England with scans in hand to see my doctor again painkillers (which put me in hospital with tacacardia) and sent me for physio, two weeks ago back had different pain so husband took me to local hospital which I will mention, (Bassetlaw, worksop) the doctor there was amazing, gave me a referral letter and now booked to see said neuro surgeon, why did it have to take this long. I have just woken up from day two of post operative removal of a disc in my neck , Very painful to swallow and muscles down back of neck are very sore...as I log on to the internet to see about these symptoms I was overwhelmed with the amount of complaints that people have had from worse to even more worse , Then I realized people who are doing fine don't need to post at all. Only if they want to give some reassurance to others in this same situation. So my Post is all is well at this point.Healing takes time , And I am thankful for the support of my Family and Great Friends. Had 5&6 disc replace to get pressure off of nerve and after 5 months still have Numbness n my left hand and a little n right hand and burning n my right leg. Can it b repair? Waiting for surgery after 5 months. Surgeon sounds very confident in performing my surgery. I am having 3 disk removed. Surgeon informed on what I have to look forward to, which is a long recovery. After all the pain for the last 5months, I am looking forward to the surgery and putting my faith in God for a great outcome. Wish me luck! Last September I went to see an Orthopedic Surgeon because I had pain after I walked 1/4 of a mile. The pain started in my buttock and it went all the way dawn my leg. He took an MRI and suggested to insert an x-stop device that would hold my vertebra apart to relieve the nerve pain. After the surgery I could walk without pain. It gave me relieve for about 3 month and the same pain started again. Today I went to see a Neurosurgeon and he suggested removing part of my bone. I am very much afraid because if that does not work he is talking about screws and pins. An advise? I had slipped disks in D12-L1-L2 the pain is continues from years, so I thought this is my body nature but recently when I did MRI the Drs told me I have this problem. What is the best solution for my case? I'm 39yrs diabetic type 2 Wight 100kg 170cm. I had my L4 disc removed.. I tried to avoid having surgery. However, it did not work.. I had to have emergency surgery. During my recovery, I have develop a right foot drop.. I now use trimix to have an erection. I guess I waited to long. Hopefully, I gain motion back for the foot drop and my fallacy comes back to life. Has anyone experience any issues such as this?